WHAT IT’S ABOUT Got dreams? So does Chip Baskets (comic actor Zach Galifianakis). He wants to be a clown. He’s gone to Paris to be a clown. But he’s bad at it. Wrongheaded. Oblivious. He’s got attitude. And pretty much nothing else. So, with his brusque new green-card-craving French wife (Sabina Sciubba of the band Brazilian Girls), it’s back to hometown Bakersfield for our 40-something drifter. That’s where his crass twin brother runs a TV career school, his mother (comic Louie Anderson, deftly cast) obsesses over curly fries, and the local rodeo finds itself in need of — you got it. Furthering his fate, Baskets promptly crashes his scooter, and begins relying on his wallflower insurance agent, Martha (comic Martha Kelly), whom he demeans as she meekly drives him around town. MY SAY If there are no small parts, only small actors, then there are no small people, either, when they’re as finely observed as this. 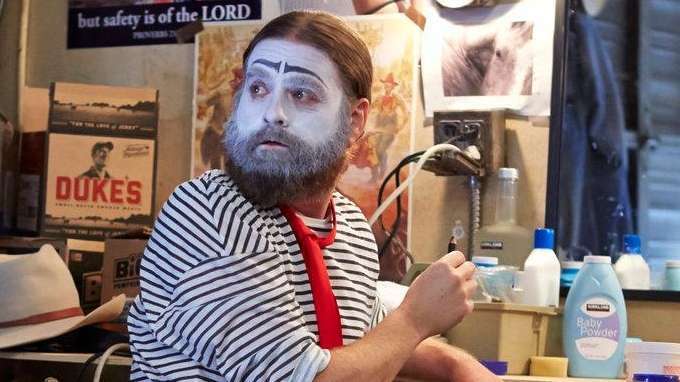 “Baskets” sometimes plays like its lead character’s idea of a deep French film, which makes it an acquired taste. And it starts out moving slowly. But like a car on a snowy road, inching along ensures that this lovingly crafted show gets where it wants to go. Through the five half-hours provided for preview, “Bas kets” builds into a character-study treasure, much like FX precursor “Louie.” That acclaimed series’ auteur, fellow comic Louis C.K., is a co-creator/producer here, alongside showrunning director Jonathan Krisel (“Portlandia,” “Kroll Show”). The two veteran funnymen find ways to find laughs, but their shows are much more intrigued by how we view ourselves, and treat others, amid life’s buffeting winds — and its minute agonies, amplified by our aspirations otherwise. BOTTOM LINE Binge on “Baskets” for best impact.